Our Tools of the Trade tour of Britain continues in Lancashire. Here, nestled in between the Yorkshire Dales and the Lake District National Park lies Holme Mills and the factory of Abbeyhorn, bone and horn carvers for over 250 years. The use of horn as raw material or tool extends much further back than the 18th Century, though, and so we must start this month’s blog with a brief historical and archaeological discursion. The use of animal horn by mankind must be as ancient as our use of any tool. 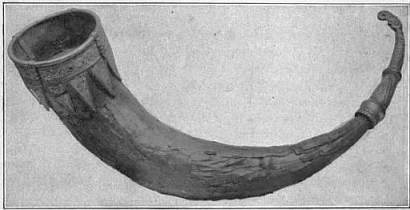 Our distant ancestors were thrifty in making use of every part of an animal, and the horn would have been no exception; many antique civilisations used animal horns as calling or musical instruments - and we still use the word ‘horn’ as synonym for brass instruments such as the trumpet today - while their shape and constitution made them perfect for carrying goods or liquids. Drinking horns were in use throughout Europe by the Iron Age and Julius Caesar later described the much sought-after 'Gaulish horn’ being used at great feasts as a drinking vessel. Horn artefacts have been discovered amongst the treasures of Sutton Hoo, and the Taplow Horn ( below ) was one of five cow’s horn drinking vessels discovered in the burial mound of a Saxon Chieftain. But it was not just the natural shape of the horn which made it so useful. Heating the horn allowed it to be shaped and moulded, and as it cooled it retained its new form. 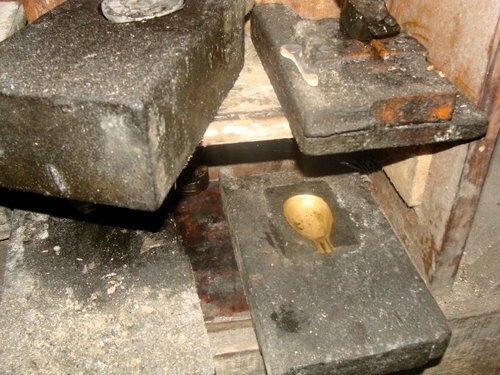 This meant that horn could be used for many new purposes and over the centuries hornworking techniques such as heating, pressing, splitting, filing and moulding came to be refined and perfected. 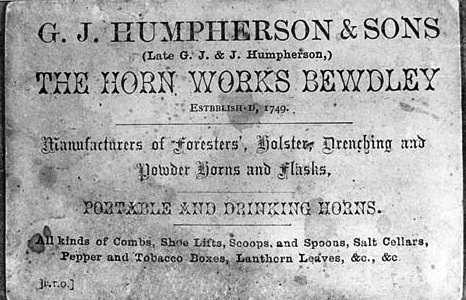 And so, by the time of Humpherson and Sons, horn was being made into combs, pipes, scoops and spoons, boxes of all size and purpose, spectacle frames, brush handles, lantern leaves and many, many other functional and useful items. It is no wonder horn is now known as the plastic of the Middle Ages. 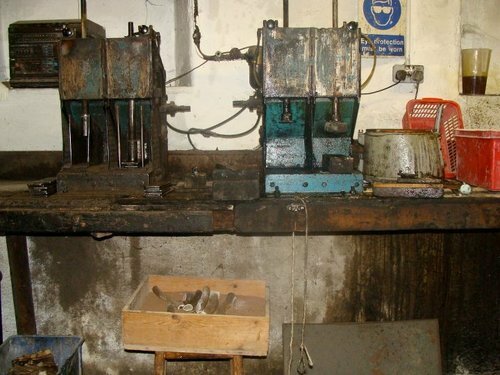 Abbeyhorn still use these traditional processes to make many of their products today. 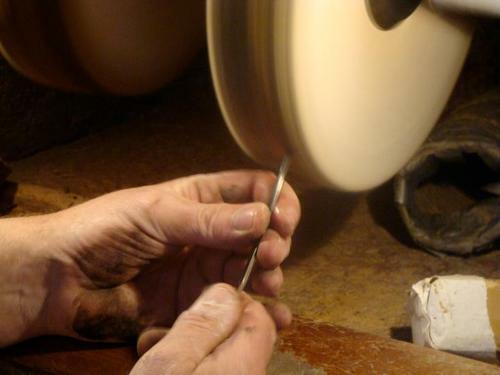 The horn is heated, bent, and set, and sanded, polished and buffed, all by hand and all by their skilled workers. Now we normally hope to visit the factories ourselves to take pictures and explain the manufacturing process, but we were unable to visit Abbeyhorn on this occasion. 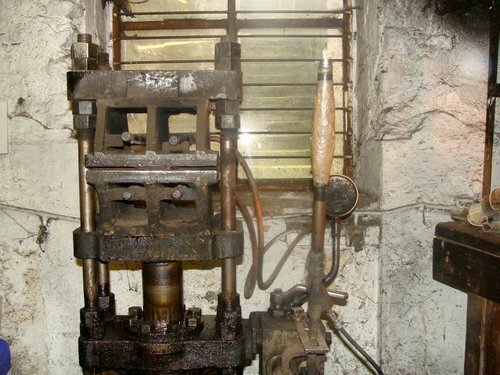 Luckily for us, however, Adam Thompson - writer of the fascinating Manufacture & Industry blog - took a trip to Lancashire recently, and he has kindly allowed us to use his pictures. 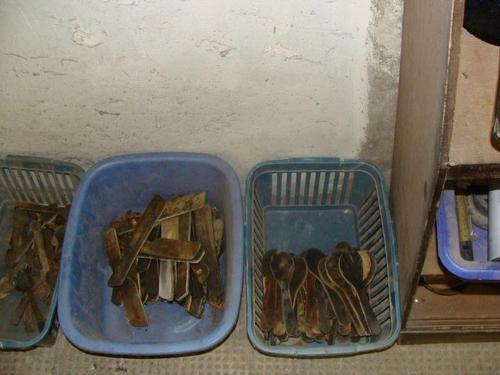 And so we can follow the manufacturing journey, from animal horn to egg spoon. The raw material comes from Africa, where the horns are a by-product of the Nigerian beef industry - domestic British cattle have long had their horns bred out of them. 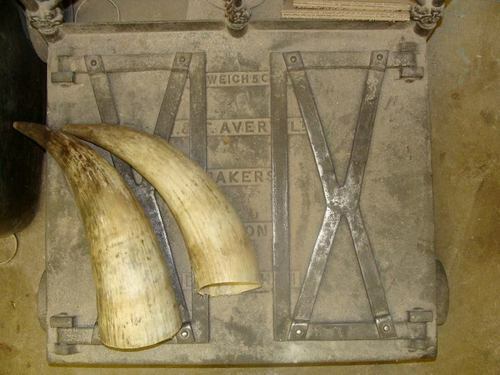 The horn is then flattened in a pressing machine before the blanks are die cut. 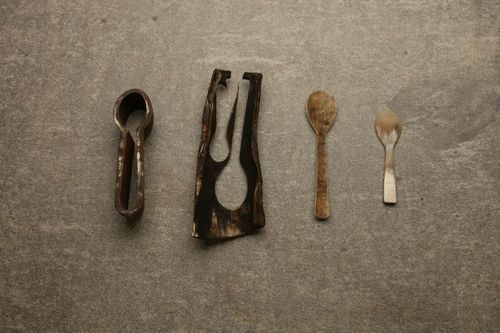 Our calendar picture shows the spoon die, a flattened sheet of horn and the two stamped spoon blanks. The blanks are then ready for sanding. 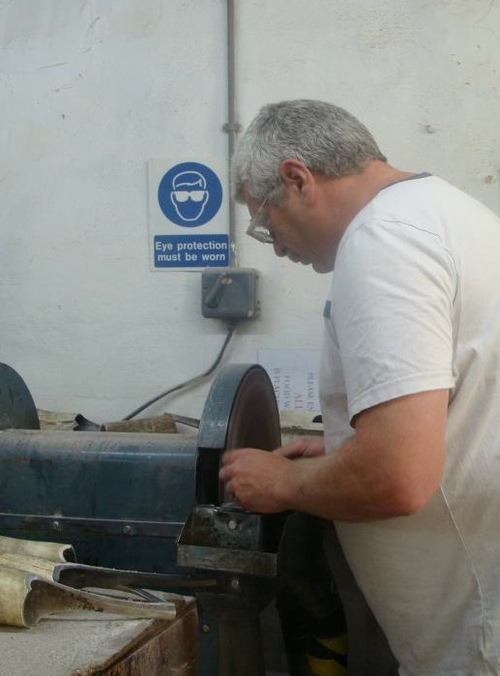 Hornworker Graham sanding the blanks. Graham has been with Abbeyhorn for over 30 years. Spoon blanks ready to be heated and moulded - and some comb blanks ready to have their teeth cut. 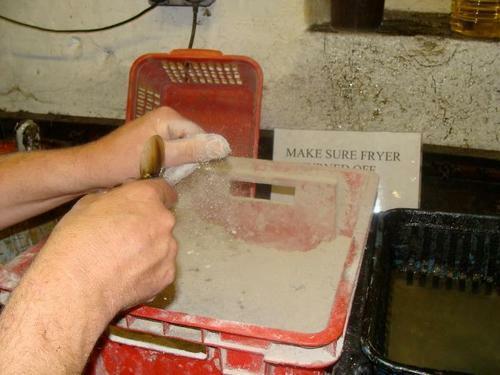 For heating small items such as spoons Abbeyhorn use a deep fat fryer. It is a delicate process though; underheat them and they won’t retain their new shape, overheat them and the horn is ruined. The warm spoon blank is sat in its mould and then pressed into shape. 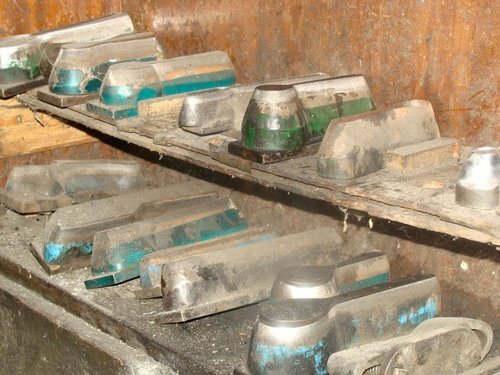 The moulds of various shapes and sizes are produced by another local company. 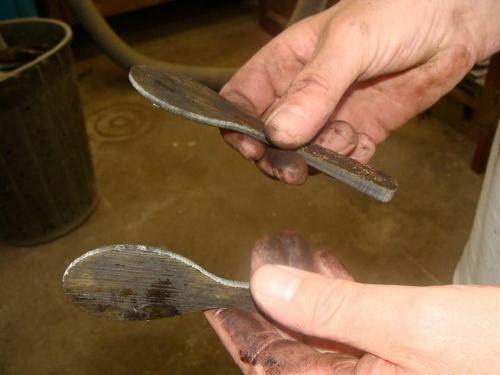 Once the bowl of the spoon has been shaped it is dipped in dust to remove any excess grease, and then it is ready to be buffed to a shine. The finished product. Each horn will have its own particular colouring and pattern, meaning every item will be unique - no two spoons will ever be alike. Colours can range from solid black to completely translucent, with every shade and stripe inbetween. 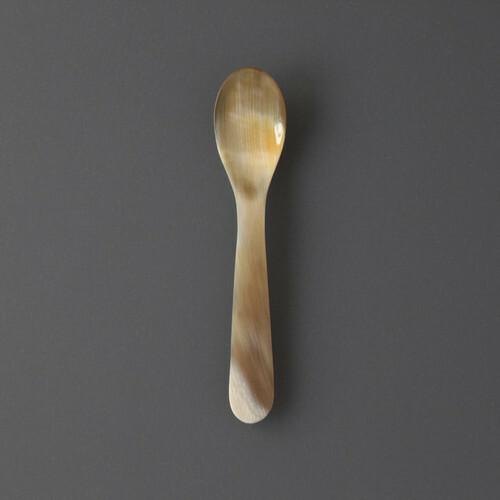 These spoons are incredibly beautiful tactile objects, and provide a little bit of luxury to everyday life - we can assure you that there is no finer way to eat a boiled egg than with a horn spoon! The horn comb is made using a similar process. 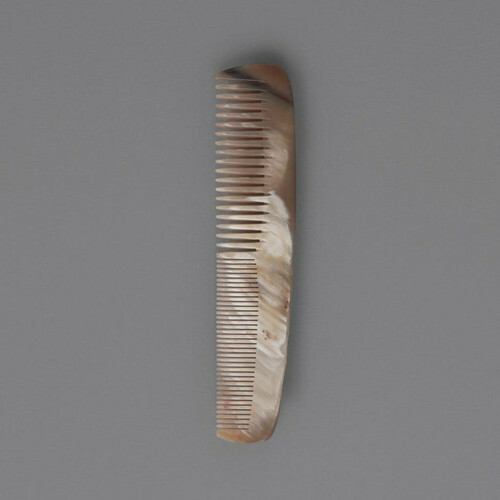 Horn makes a perfect choice for a comb, as hair and horn are essentially the same material - keratin. 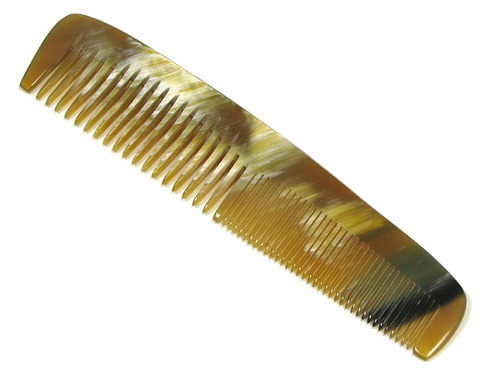 A horn comb will thus be kinder and more comfortable to your hair than a plastic comb, and will help keep your hair nourished, healthy, sleek and shiny. 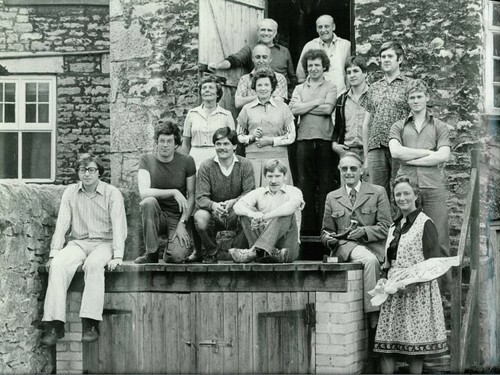 Abbeyhorn is currently in the safe hands of The Cleasby Family, the fifth owners in the company’s long history. From its base on the borders of the Lake District Paul Cleasby and his small team of co-workers continue to hand craft their horn, bone and antler -wares in the same way as all those generations of hornworkers before them. Many thanks to all at Abbeyhorn for sharing their tools with us, and thanks again to Adam at Manufacture & Industry for the use of his pictures. Horn Egg Spoons and Combs are available at the Labour and Wait shops in Redchurch Street, Dover Street Market, and from our website.